Over the past 20 years, we have seen water pumps and cooling systems evolve to improve start-up emissions. We have also seen a revolution in the material used for engine blocks, cylinder heads and cooling system components. Today, coolant may flow through an iron block, aluminum cylinder head and plastic thermostat housing. Sealing these components is a challenge for engineers because they have different rates of expansion. Ordinary fiber gaskets and some sealants can’t keep up with expansion and contraction of the different components. Consider the mechanical forces on a water pump. Most water pumps have force applied to the housing by the accessory drive system’s belt. This side load creates stress for not only the shaft, but also the housing. 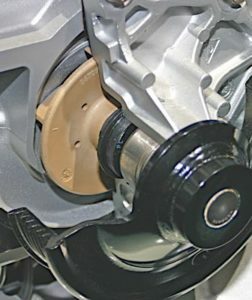 Some OEMs power the pump with a pulley mounted to a camshaft. With these changes to the engine and water pump, the gaskets have also changed. Some water pumps are sealed with O-rings on their inlets and outlets. In most cases, no sealant is required. 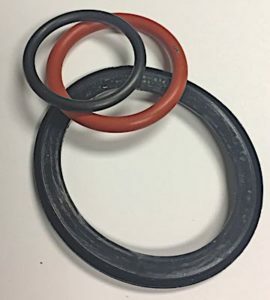 Most installation instructions advise that these O-rings are to be coated with coolant or oil to lubricate the seal and allow the two components to expand and contract independently. Before installing an O-ring, make sure the surfaces are smooth and free from debris. In addition, inspect the housing for cavitation damage: The O-ring can’t seal a surface that is pitted. Modern carrier gaskets placed between an engine and water pump allow the two components to expand and contract without breaking the seal. These types of gaskets have elastomeric materials molded onto the surface of a plastic or metal part. These types of gaskets are “squished” in place. Their thickness and materials determine the sealing abilities of the gasket. Also note that the amount of clamping force is critical and the use of a torque wrench is recommended. 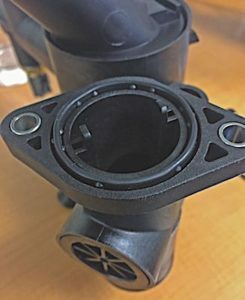 If a new or remanufactured water pump comes with a carrier gasket, you are not improving the seal by coating it with a sealant from a tube or spray can. In fact, you could be causing problems by not allowing the gasket’s lip to change shape to accommodate different rates of expansion. Beyond that, the added substance might not be chemically compatible with the new gasket. If a carrier-style gasket requires a sealant, some will include a portion in the kit. Most replacement gasket manufacturers will include instructions for installation that will outline whether or not sealants need to be applied. The main killer of water pump gaskets is the coolant. Fresh coolant includes buffers that can control the pH. Neglecting the coolant replacement intervals can deplete the coolant’s additives that keep gasket materials conditioned. Cavitating acidic coolant is even more damaging to plastic composite impellers and gaskets because the vapor becomes acidic. In addition, gaskets are designed to be compatible with the coolant formulation. If the wrong coolant is used, it can cause the plastic carrier gaskets to become brittle. The wrong coolant can also attack the water pump’s shaft seals. Up to a 70% mixture of antifreeze can be used in extremely cold climates to lower the freezing point of the coolant, but the tradeoff is reduced cooling efficiency since ethylene glycol carries heat less efficiently. If the concentration of antifreeze to water is too high in hot weather, it may increase the risk of the engine overheating and make cavitation in pumps more likely to occur. The coolant additive packages contain wetting agents or surfactants that reduce surface tension and allow the coolant to transfer heat more efficiently. The health of the overall cooling system can contribute to water pump cavitation and damage to the gaskets. If a system is not able to transfer heat effectively, it will cause hot spots and increase the pressures in the system. In addition, leaks in the system can cause cavitation in pumps because the vapor point of the coolant is lower due to the lack of pressure. This is why pressure testing is important. 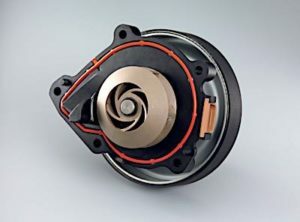 Restrictions in the system can cause pressure and suction changes that can lead to water pump cavitation problems because of changes in how the coolant flows over the impeller. Restrictions can be caused by a collapsed hose or a clogged radiator. Installing a new water pump on a system with a restriction can limit the life of the new pump. If a vehicle that has overheated has been brought to your shop, it is critical to flush the system. Some drivers will top off the system with tap water or the wrong coolant. Just topping off the system will not remove the contaminated coolant; it only dilutes it. When diagnosing any cooling system problem, it is critical to pressure-check the system. This can help you find all the leaks before you quote an estimate to the customer. A modern cooling system can be very complex with separate channels for the heads, block and heater core. This increased complexity can make a water pump and attached components look like an artificial heart. Leaks can be as small as a hairline crack on a component, but the loss of pressure can cause an overheating problem. It is also critical to pressure-check the system after a repair has taken place. This is often the only way to confirm that the repair was successful.